Whenever I read a new-to-me author, I always think about my high school literature textbook. In front of every unit, whether it be the Reformation or the Romantics, there’s always an introduction explaining what was happening in history at that time. I think that’s an important thing to consider when delving into a new author. What’s their writing history? What style can I expect? How fair is it to expect shape-shifting vampires from principled beta-heroes? Setting your tastes for a specific kind of story is the essential task of any reader, to my thinking. So I set my tastes for a contemporary romance set in the kind of frigid winter landscape that seems to be dominating the news of late. Terribly abused by her husband for years, Amanda Banning has finally found the courage to escape his punches by fleeing, along with her six-year-old daughter, to Mystic Creek, Oregon. Starting over is difficult enough with the little money Amanda’s earning at the elementary school cafeteria, but the constant fear of being found is what's really whittling Amanda down. She must guard her every move, even resorting to paying her rent in cash so her ex can't trace her actions. As such, Amanda’s only outlet is to write down everything--her hopes, problems, and dreams--on little pieces of pink paper and let them go in the wind. Jeb Sterling wants to know who's littering on his property. Annoyed, he collects handfuls of pink papers only to turn one over and read the message on the other side: "My only weapons are a cast-iron skillet and a butcher knife...I will die before I let him hurt my baby again." He reads them all only to find himself strangely drawn to the person on the other side of the pen. He can already sense who she is: loving, loyal, damaged. So he figures out where the messages are blowing in from and volunteers to check the citizens of that particular section of Mystic Creek when a terrible winter storm threatens. At the end of the day, he finds Amanda--guarded and suspicious--living with her shy daughter in a dilapidated rental that has lost its power. Knowing they may not make it through the night, Jeb insists they stay with him. And when Amanda's roof collapses the very next day under the heavy snow, Jeb is surprised to find himself convincing her to stay with him indefinitely. What ensues is the gentle drama of gaining Amanda's trust while taking care of her in such a way so as not to damage her pride and newly found independence. Silver Thaw is written in a manner that allows the reader to tuck right in with it. It has all the elements: damaged heroine, uber-patient hero, the specter of the heroine’s abusive husband out there (somewhere), and one hell of an ice storm. My complaint, however, is about chemistry between Amanda and Jeb, but that may stem less from the quality of Anderson’s writing as it does from the story structure at its foundation. One can't have panting, steaming hot chemistry in a story about an abused heroine. She'd be a flight risk at the first puffing up of an alpha male. It just doesn't work. Not with her emotional state of mind. At the same time, the plot structure of the book seems to work against itself in that the endless patient coaxing between the h/h becomes a little tedious, particularly in the middle. But even the title, Silver Thaw, suggests the pacing of the book. It isn’t called Ice Boom, after all. Readers can be sure, however, that the book picks up when the suspense kicks in. There’s even a subtle twist in the resolution that honors Amanda’s resilience and newfound strength. And since Anderson’s writing is solid, I can recommend Silver Thaw, especially if you’re in the mood for a good winter read in which love heals the worst wounds. Set your tastes for it. And bring a warm blanket. LOVED IT!!!!! I love Catherine's books, and definitely consider this one of my favs. I'm glad you did, Patoct. Hi Julianne! Was this your first Catherine Anderson book? I like her Coulter brothers series (proof, I remembered the name without checking!) for a bit of a sob and a snivel. They are very cathartic and very touching. I have not read many of her books since the Coulters and Kendricks, though, but I might give this one a try. The last one I read was an inspirational novel, or if it wasn't, it should have been. Is this one very Christian? My friend, it had certain Christian elements (the hero prays and the heroine is impressed), but it wasn't an Inspy. I think that Anderson is the only author for whom I have read everything available to me. I didn't think Silver Thaw was among her best and would agree with the 4-star rating. Like Bridget I loved the Kendrick-Coulter series but would rate her Comanche books as absolute favourites! Hi Q, I haven't seen you on the web in so long. Happy you're here! I'm glad you agree with my review. I try to be fair by taking my own preferences into account. Still, it's clear she's a good writer. Thanks, J! I really do enjoy your reviews. 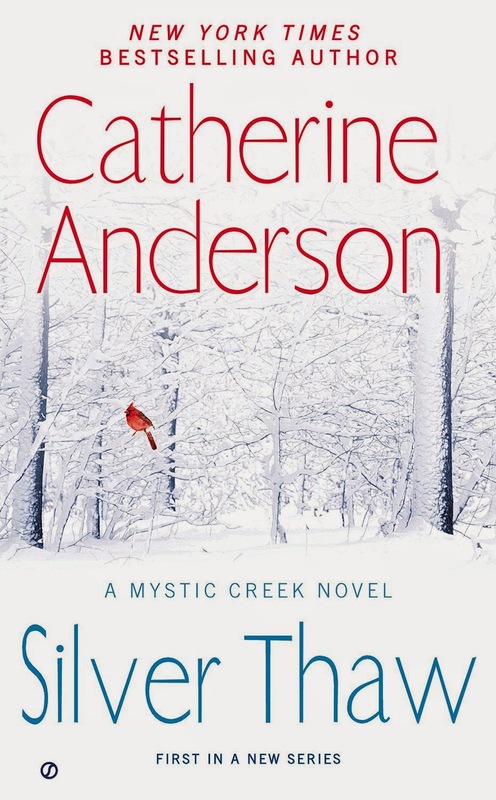 I read several of Catherine Anderson's earlier books but haven't picked up anything recently. I may give this one a try. You may want to wait until after the next couple of days, PJ. We may be busy thawing ourselves out--if the weather-people have anything to say about it. I'll be downloading, J. I'm not going anywhere on these roads. We already have a layer of ice on the parking lot. I've enjoyed many of Catherine's books, but haven't read any in a while - need to catch up - this reminds me why I loved her stories! I have read a few other books by Catherine & this one is on my list. Perfect Timing and Walking on Air were really good! Both had a time travel element. I've read a couple of her books and really enjoyed them Thank you for your excellent review.